Kenny Mellman as Herb and Justin Bond as Kiki in "Kiki & Herb: Alive From Broadway." Imagine some weird amalgam of torch singer and aging rock queen -- call her Janis Merman, say, or Eydie Nicks -- and give her an accompanist who simultaneously channels Liberace, Jerry Lee Lewis, and Elton John. Hand them a playlist that ranges from Dan Fogelberg to Radiohead . Add whiskey and stir, and you've got yourself the otherwise indescribable stage phenomenon that is Kiki & Herb. 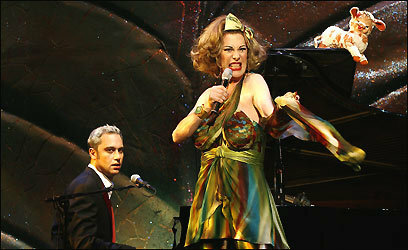 Justin Bond and Kenny Mellman, the alter egos of "boozy chanteuse" Kiki and her slightly addled accompanist Herb, created their drag parody of a cabaret act in a San Francisco gay bar in the 1990s. Since then they've appeared in London, off-Broadway, and finally on Broadway, where they earned a Tony nomination this year in the "special event" category. They lost the Tony to Jay Johnson, the ventriloquist whose "puppet act" they describe in unprintable terms in their show at the Boston Center for the Arts, "Kiki & Herb: Alive From Broadway." But Kiki and Herb are survivors, baby. And the funniest moments of their show, which are very funny indeed, have all the insane excess and weirdly sincere insincerity that a true show-biz survivor must have. Take "Same Old Lang Syne," the sappy Fogelberg tune that Kiki shoehorns into one of her rambling "autobiographical" anecdotes. After a shaggy-dog story involving a cab ride to Delaware in search of her estranged daughter, Kiki launches into the song, and her unbridled sentimentality, histrionic sense of timing, and world-weary throatiness bring out every ounce of its pretentiousness and bathos. It's hilarious. It's also, in a way that sneaks up on you, oddly touching. Here is this ridiculous creature, bedecked with glitter eye shadow and bilious chiffon, delivering a completely made-up tale of woe by sending an already kitschy pop song over the top. There is not one thing here that's real. And yet somehow it provokes a flash of real sadness, or pity, or empathy -- you can't quite name it before it disappears again under the helpless laughter. But it's there, and it, along with Mellman's prodigious piano playing and Bond's wild but technically expert singing, gives "Kiki & Herb" its peculiar grip on the imagination. Sometimes that grip loosens a bit, unfortunately, because one thing Kiki and Herb don't have -- and really need -- is a director. The brilliant bits are truly brilliant, but there are too many saggy spots, and a little too much of the boozy-broad humor, in the semi-improvised material in between. Or at least there were at Wednesday's performance; Bond and Mellman are reportedly trimming some dialogue. That's wise, because though the wacky rambles through their back story are amusing in small doses, right now they're too long and too much alike. There's also some strangely undigested political commentary stuck in here and there -- nothing that a nice liberal audience would disagree with, but it has a different tone from the rest of the show, and it seems to leave people wondering whether to applaud the sentiment or keep laughing because it's supposed to be part of the joke. Still, you have to love a "septuagenarian" singer who's still belting out "Forever Young" and giving it every ounce of youthful passion she can muster. Scary. Silly. Kiki. There's only one way to top it, and that she does with her encore -- which melds "Love Is a Battlefield" and "Total Eclipse of the Heart," then wends its way through "Turn ! Turn ! Turn !," "Turn Around," and Yeats's falcon, "turning in the widening gyre," before it's done. Or was that Joni Mitchell's falcon? Whatever it is, by the time the "song" is over, there's only one singer who could do it. As the fawning Herb intones, with an almost invisible glint of malice in his eye: Ladies and gentlemen, Miss Kiki DuRane. Set, Scott Pask . Costumes, Marc Happel . Lights, Jeff Croiter . Sound, Brett Jarvis . Presented by Huntington Theatre Company.